Stallions undefeated in first year. 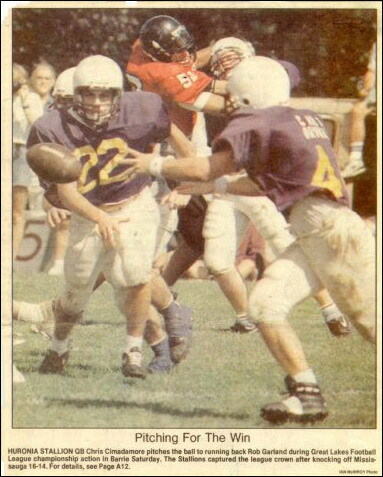 The Stallions 19 and under program began in the summer of 1993. 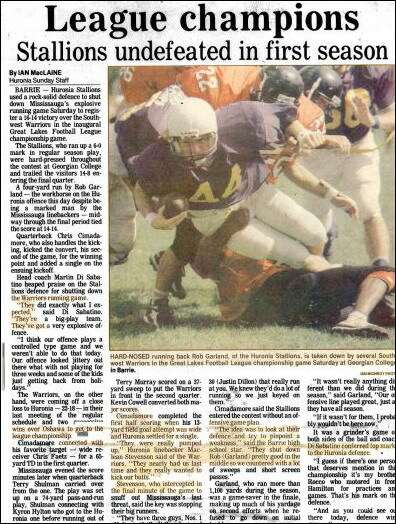 With the Mississauga Warriors and the Oshawa Hawkeys formed the Great Lakes Football League. The Stallions ran up a 6-0 regular season record and registered a 16-14 championship victory over the Mississauga Warriors to finish a perfect 7-0. The Stallions produced the league MVP (Rob Garland). That same year the Stallions defeated the Myers Riders (Ottawa) and the Mississauga Wolverines of the Major Midget Football League. The second year the Stallions returned to the championship to face once again the Mississauga Warriors. The Warriors defeated the Stallions 37- 27 to capture the championship. In 2000 the Stallions began their development House league program in Barrie and Orillia. This Program has grown each year , it has greatly contributed to the success of the Stallions travel teams. Throughout the years the Stallions have produced some fine football players that have gone on to play university football. 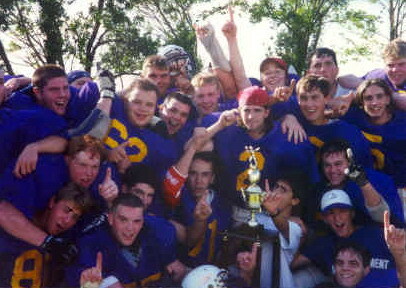 Rob Garland, League MVP 1993 (York University), Chris Faetze, League MVP 1994, (St Mary's University), Kevin Taylor, League MVP 1995 (Laurier University), Clint Uttley 1993. Current Defensive Coordinator for the Stallions (Acadia University). Over 30 players are currently in University programs. The Stallions would like to thank all those that were involved in the beginning and those involved today in shaping our team and league. THANK YOU! !